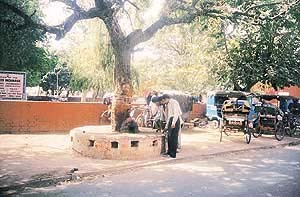 BEHIND the Kiran theatre and near the boundary wall of Veterinary Hospital in Sector 22, Chandigarh, is a tree which is worshipped by a large number of people. The tree (prosopis cineraria) is known as jand in Hindi and Punjabi, jandi in Haryanvi, khejri in Rajasthani, and sami or samri in Gujarati. Referred to as the golden tree of Indian deserts, it plays a vital role in preserving the ecosystem of arid and semi-arid areas. Basically jand tree is a symbol of socio-economic development of the arid regions. Since all the parts of the tree are useful, it is called kalp taru. It is also known as the ‘king of desert’, and the ‘wonder tree’. People down the ages have held this tree sacred. In June, 1661, two women of Bishnoi community from Jodhpur district laid down their lives in protest against the cutting of khejri trees. Again in July, 1787, more than 300 people, including women and children, sacrificed their lives to save khejri trees from the King of Jodhpur. During Vedic times, khejri wood was used to kindle the sacred fire for performing a yajana. In Hindu epics, the Ramayana and the Mahabharata, mention the usefulness and significance of this tree. Lord Rama worshipped khejri tree, which represents the goddess of power, before he led his army to kill Ravana. The worshipping of this tree is referred to as samipuja. Pandavas also worshipped this tree and hid their weapons in it during their agyatavasa. Mainly men and married women worship jand tree, in an elaborate way. First of all oil lamps are lit and placed at the base of the trunk. Then incense sticks are lighted and vermilion is applied on the tree. This is followed by tying of the sacred thread (mauli) around the trunk. The head of the family and other male members circumbulate around the tree thrice or seven times. Then prasad prepared from home is offered and joint prayers are held. Finally, the head of the family applies tilak to all male members. Sometimes, the married women also perform the same ritual. Some families, belonging to Chandigarh or the adjoining areas of Punjab and Haryana, have been performing religious ceremonies under the tree for the past many years. Many people offer prayers at this sacred spot to mark the birth of a child or a marriage in the family. While worshipping this tree, the devotees have to keep two precautions in mind. Firstly, the entire prasad brought from home has to be either distributed or consumed at the revered site. Secondly, the tilak applied on the forehead of the members of family has to be wiped off before they leave this venerated place. To go home with the prasad and tilak is considered inauspicious. Khejri tree provides shelter and protection to animals and birds in desert areas. This tree is home to many large birds like kites, hawks and vultures. Many Rajasthani families use the green and unripe pods (known as sangri) in preparation of curries and pickles. The importance of the medicinal value of sami tree has been highlighted in our ancient literature. The bark of the tree provides immediate relief to a person bitten by snake or scorpion. Its leaves and fruits are used in preparing medicines for curing nervous disorders. The medicines prepared from its bark are also used for treating diarrhoea, dysentery, piles, worm infestations and other skin problems. The bark is also used to cure leprosy, bronchitis, asthma, tumour of muscles and to improve concentration. The gum of the tree is nutritive and good in taste and is used by pregnant woman at the time of delivery. Almost all the parts of this tree are used for the benefit of mankind, thus justifying its name kalp taru.